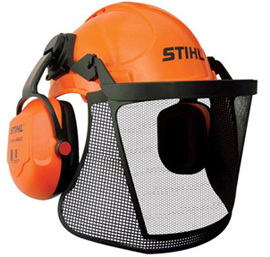 This STIHL Chainsaw helmet kit combines head, eye and ear protection. Features include helmet with easy ratchet adjustment, steel mesh multi fit visor with smooth cam-action movement. Comfort- MAX medium noise earmuffs (28 dB(A)) and terry towelling headband. Available in orange and yellow, corresponding to the NZ Standards. For more information, please contact your local STIHL Stockist.